Seating and Wheeled Mobility: A Clinical Resource Guide presents clinical assessment considerations when working with a person with a disability who may need wheelchair seating for postural support, skin integrity, or a wheelchair base to best meet dependent or independent mobility needs. Michelle L. Lange and Jean Minkel have designed this text to support occupational and physical therapists, complex rehabilitation technology suppliers, and even third-party payers who are interested in wheelchair seating and mobility assessment and applications. Seating and Wheeled Mobility provides a wide spectrum of information from foundational information for those practitioners who are new to the field to in-depth, population-specific information for practitioners who perhaps have not worked with a particular population in the past. Information sharing, opportunities for demonstration and trial, and patience on the part of the clinician working with the person with a disability are all critical precursors to the actual process of making equipment recommendations. Seating and Wheeled Mobility is divided into sections, each addressing a different area of clinical practice. The first section is an in-depth presentation of the assessment process and the critical understanding of pressure management needed by the clinical team when working with a client population who rely on wheeled mobility. The second section focuses on postural support. Also included is a completely updated method to measure and describe the seated person and related support surfaces needed when recommending a device. The third section lays the foundation for clinical decision making around the assessment for and application of the most appropriate wheeled mobility device. The fourth section provides in-depth clinical applications for each category of mobility devices. Also addressed is proper documentation to assist in the funding of these devices. The fifth section provides population-specific information regarding the clinical application of position, pressure management, and functional mobility as it applies to the pediatric, geriatric, and bariatric populations, as well as persons with both degenerative and complex neuromuscular impairments. The last section presents additional considerations when working with persons who are aging with a disability, environmental assessments, transportation, and the application of standards. 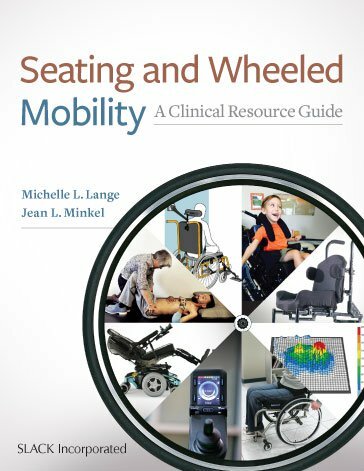 Seating and Wheeled Mobility: A Clinical Resource Guide provides the depth and breadth of the clinical practice of wheelchair seating and mobility to both those who are new to the field, as well as seasoned professionals. Michelle L. Lange, OTR/L, ABDA, ATP/SMS is an occupational therapist with 30 years of experience and has been in private practice, Access to Independence, for over 10 years. She is a well-respected lecturer, both nationally and internationally, and has authored numerous texts, chapters, and articles. She is the editor of Fundamentals in Assistive Technology, 4th edition, NRRTS Continuing Education Curriculum Coordinator, and Clinical Editor of Directions magazine. Michelle is on the teaching faculty of Rehabilitation Engineering and Assistive Technology Society of North America (RESNA). She is a member of the Clinician Task Force. Michelle is a certified ATP, certified SMS, and a Senior Disability Analyst of the American Board of Disability Analysts. Jean L. Minkel, PT, ATP is a physical therapist and master clinician well recognized for her work in assistive technology. She is currently the Senior Vice President of Care Coordination and Rehabilitation Services for Independence Care System, a nonprofit, Medicaid long-term care program in New York City. Jean is also an independent consultant who provides educational and consulting service to all members of the assistive technology team—consumers, therapists, suppliers, manufacturers, and payers. Before entering the private sector, Jean was the Director of the Seating and Mobility Program at the Center for Rehabilitation Technology at Helen Hayes Hospital in West Haverstraw, NY. She produced the video series Spending or Investing—Funding Assistive Technology. She is coauthor of the Wheelchair Selection Guide: How to Use the ANSI–RESNA Standards, the Manual Mobility Training Guide, and the Power Mobility Training Guide. The assistive technology community has recognized Jean for her contributions with the RESNA Fellow award in 1995 and the Sam McFarland Mentor Award in 2012.